• The market for comic books and graphic novels in the Middle East is small, but growing. In this, the first part of a two-part series, we report on a recent conference in Cairo for comic book artists writing in Arabic, and look at Samandal, a popular bilingual comics magazine published in Beirut. • Next Tuesday we look at how graphic novelists in the Middle East are pushing the boundaries of publishing by tackling controversial topics in their work, but also paying a price for challenging taboos. 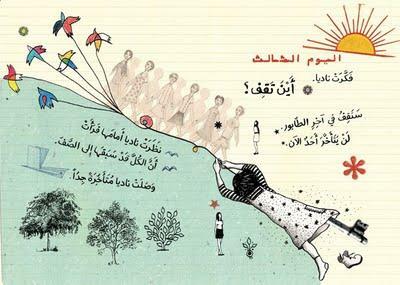 CAIRO: For the moment, the Arabic-language comics industry is still very small: the number of graphic novels originally written in Arabic (rather than translated from other languages) can almost be counted on one hand. However, that looks likely to change in the next few years, as writers and illustrators from the region are finding new creative outlets and developing comics as a popular art form, not only for YA readers, but increasingly for adults. Reflecting this emerging interest was the recent three-day workshop held in Cairo on comics and other books for teenage readers in Arabic, co-organized by the Goethe-Institut and the European Union-funded NGO Literature Across Frontiers. The workshop, titled “A Difficult Age: Books for Teenagers between 13 and 18 Years,” drew illustrators, writers, and children’s authors from across the Arab world. The organizers have already planned a second workshop this fall, scheduled for September 29-October 1. Thirteen authors and illustrators from Egypt, Lebanon, the West Bank, and the UAE attended the workshop from June 23-25, where sessions were run by children’s authors Jukka Parkkinen of Finland, Fatima Sharafeddine of Lebanon, and Rui Zink of Portugal, as well as graphic novelist Barbara Yelin of Germany. One of the participants was Rania Amin, the Cairo-based author and illustrator of a popular series of illustrated children’s books featuring a girl named Farhana. What Amin found most beneficial from the workshop was learning how to make “a graphically illustrated page so much more different and developed than the original text, and not merely a plain illustration of the text.” Amin described herself as “very much interested” in expanding into writing a graphic novel for teenagers and adults, and had already begun working on one before the workshop. As a child, she read a lot of comics, mentioning Tintin, Asterix, Lucky Luke, and Charlie Brown as favorites, “but what really got me interested in the world of comics were the stories I have started reading only recently as an adult, that were more serious in nature,” citing as influences a number of French- and English-language graphic novels, including Chris Ware’s Jimmy Corrigan: The Smartest Kid on Earth, Art Spiegelman’s Maus, Adrian Tomine’s Sleepwalk and Other Stories, Daniel Clowes’ Ghost World, Frederik Peeters’ Blue Pills, and Marjane Satrapi’s Persepolis, which has been published in an Arabic edition. Jana Traboulsi, a Beirut-based children’s books and comics illustrator (an example of whose work is displayed above), also credited “the work of more independent artists,” particularly from the major French comics publisher L’Association, rather than the comics she read as a child, for drawing her to comics. “There is definitely an audience for them among the youth,” she adds. “I think that readers are looking for works that talk about issues of concern locally, instead of being ‘imported,’ and are mainly looking for work of good quality.” The Goethe-Institut/Literature Across Frontiers workshop “allowed me to get a taste of a few writing narrative techniques — something I have no professional training in,” she points out, while allowing her to expand her network of contacts with like-minded artists and writers in the Arab world. While comics have long been popular among children in the Arab world (two of the biggest series are the venerable “Mickey Mouse” and the Egyptian-based “Aladdin” comics), there is a new spark of interest in adult comics in the region. “In the last two years, there’s been a kind of synchronicity in Egypt, Lebanon, and Emirates for graphic novels,” says artist and writer Magdy El Shafee. In March, for example, the young Emirati author, Qais Sedki, won the prestigious Shaykh Zayed Book Award for his graphic novel Siwar al-Dhahab (Gold Ring), the first Arabic-language manga comic. Baki cheekily describes himself as a product of “a childhood rife with comics, telly, and Nutella,” and like his co-editors, he is a graduate of the American University of Beirut. Samandal publishes comics in Arabic, French and English in each issue: with sections switching between left-to-right and right-to-left scripts, they hit upon the innovation of what they call a “flippy page” — a page instructing the reader to flip the magazine upside-down to continue reading the next section. READ: More about Jana Traboulsi’s work. DOWNLOAD: Back issues of Samandal. DISCUSS: Are comics a universal medium?